The month of February has just flown by, and I share with you my message for February on this last day of February in just the nick of time to call it my February message. 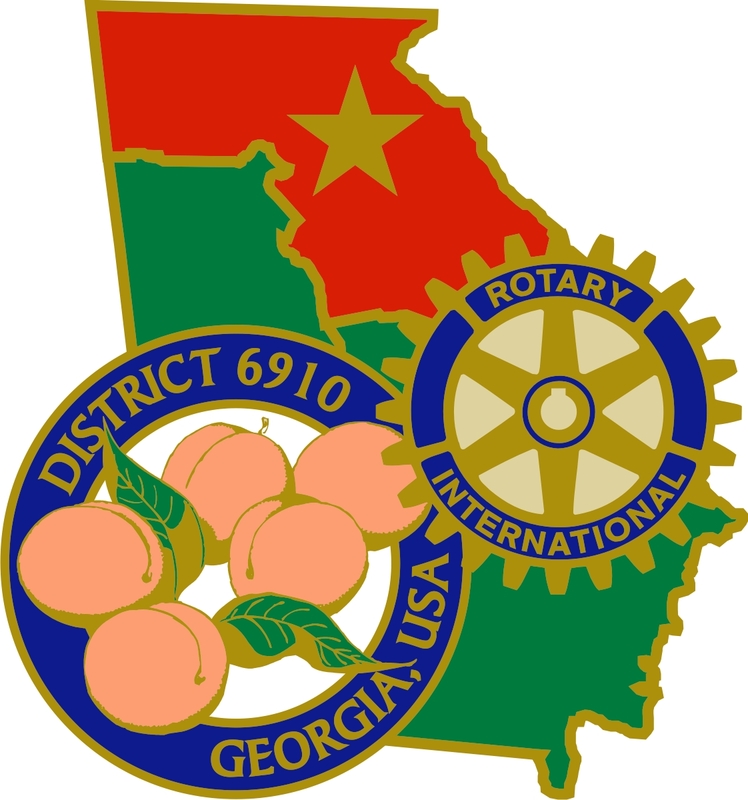 One of the things I've enjoyed most in this journey as your District Governor is seeing all the good that our clubs are doing right here in District 6910. I have several issues of this 'Rotations' newsletter queued up within the next few weeks that will let you see firsthand how our District 6910 Rotarians have been changing lives, serving humanity. I hope you'll consider subscribing, by email, to this newsletter so that you won't miss a single story. As you know, our Centennial celebration of The Rotary Foundation peaks in Atlanta this June when we welcome the world to Atlanta. Please take advantage of how easy it is to get to Atlanta and enjoy all this International Convention has to offer. My life was forever changed when I walked into the first Rotary International Convention I ever attended in 2011, in New Orleans, hearing Bill Gates speak to thousands of Rotarians from all over the world as to how we were 'this close' to ending polio. It let me see that I really was part of an organization that could change the world. It's not too late to get registered. I hope you will today. Speaking of polio, the world saw 74 cases of the wild polio virus in 2015. In 2016, there were 37. To date this year in 2017, we have seen three. We could have very well seen the last case of polio. What a celebration that will be when we have rid the world of this dreaded disease. Thank you for your continued support of The Rotary Foundation, and in particular to our PolioPlus fund, where our contributions are still matched by the Gates Foundation 2 to 1. Our district has seen record giving to the PolioPlus fund of The Rotary Foundation in this 2016-17 year. I thank you for your continued generous giving to The Rotary Foundation. One of the goals that the three Georgia governors set prior to taking office was to work to see that each of Georgia's three district's clubs achieved 100% Paul Harris Fellow Clubs in entirety. If you are not yet a Paul Harris Fellow, and you are interested in becoming one, please contact me directly and I can help. 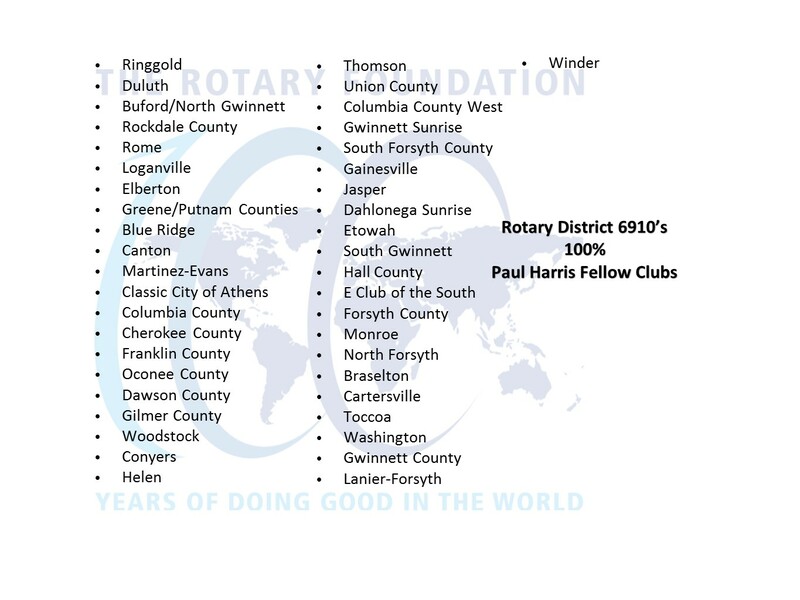 A Rotarian achieves 'Paul Harris Fellow' by donating $1000 outright to The Rotary Foundation or by receiving recognition points from another Rotarian to total 1000, combining the dollars actually given and recognition points. Our goal is to welcome the world to Atlanta, Georgia with a 100% Paul Harris Fellow state. To date, 43 of our 73 clubs have achieved 100% Paul Harris Fellow Club with several others very close. Congratulations to these clubs on this outstanding achievement! 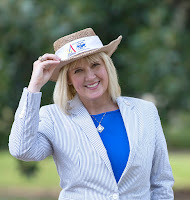 With 122 days remaining in my term as district governor, there is still so much to do. We will celebrate our clubs' achievements at District Assembly on Saturday, May 13. Also, we will do the ceremonial change of governors that day, inducting District Governor Elect David "Coop" Cooper. I hope to see you there, if not sooner.